Buying a home is never an easy process. There are so many different things that you have to think about to make sure that you get everything just right. One of the first steps that you will (or should) take is finding Santa Barbara realtors that you can depend on to help you find the perfect home that you have always wanted. There are so many different Santa Barbara realtors to choose from, but you should make sure that you find one that is professional, helpful, and provides you with the resources that you need to get your dream home. Santa Barbara realtors know all about the market, the home buying process, and different things that you need to look for. When you choose to work with professionals, you will generally get a better experience and end result than if you went through the process alone. Especially if you are buying your first home, you need to rely on Santa Barbara realtors to help you learn the ropes. Otherwise, you could end up in a lot of trouble with a home that you either don’t really love or that you overpaid for. There are so many things that can go wrong in the home shopping process, but Santa Barbara realtors can help eliminate those issues and lower any risk that you might face when it comes to buying a new home. The risk can’t really be taken away completely by any means, but when you choose to work with Santa Barbara realtors you will have a much easier time finding real estate and have a lower chance of trouble along the way. You can learn about foreclosures, Santa Barbara real estate trends, and even consider buying Montecito luxury foreclosures because you have a trusted agent helping you ensure that you choose the best home possible and weigh all the different elements that are involved. 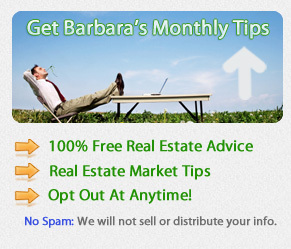 Santa Barbara realtors are professionally trained to help you in the home buying process. They are aware of the different properties and neighborhoods that are available, and which areas are best for different people. They can give you the information about living downtown, foreclosures, commercial property, or anything else that you need to know. It’s their job to know everything that they can about Santa Barbara real estate, and you can depend on them for all the assistance and information that you need. Buying a home is a big deal, but can be much simpler if you let Santa Barbara realtors help you. About Barbara Reaume: Barbara Reaume began her career in real estate at Coldwell Banker 26 years ago selling residential and income property in the San Marino, Pasadena, La Canada and Arcadia areas. Her enthusiasm in real estate marketing, together with customer service and her expertise gained over 26 years in the industry will assure her buyers and sellers of a quality experience.